Barring pretty UI, this is pretty much it. I can do better. I can do so much better than this. It will won’t even take forever. I could even justify this as “positive feature creep”, as in, features that pay back more than the time saved not doing them. 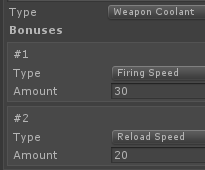 More practically, I want to make features that I would want in a game, even if it costs me time. Because the other cost is motivation, and it’s much harder to come by for me. I’ve been thinking about upgrade design and progression. I’ve been writing and sketching some ideas down to come up with some reasonably not-too-overscoped features. I want to add RPG-ish mechanic elements to the game. Basically, experience, gear, stats — that sort of stuff. So not really “role-playing”, but the dressing of mechanics that RPGs have. 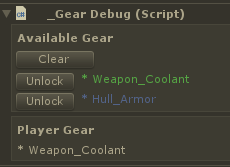 In short (I will describe these in more detail as I implement each), the features I am going for are: experience, upgrades, gear, scrap. Player gets experience for killing enemies, then they can buy upgrades for levels they acquire. They also collect gear from enemies and chests, and can craft gear items. Some upgrades unlock gear as well. 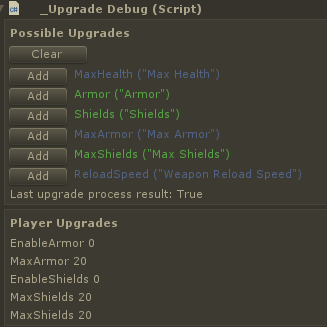 Before I can get to any actual features or UI, I need to redo my upgrade framework. 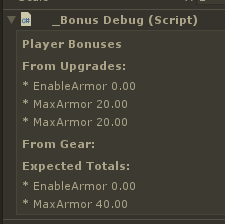 This is a short description, but it’s a lot of underlying framework to make it all use the same bonus concept, so that I can aggregate bonuses from my upgrades and from my gear. So a health upgrade might give me 20 health and a “reinforced hull” gear item can give me 30 health, and these would sum up. I removed level, cost and dungeon level requirements from upgrades. This makes them simpler, more streamlined. Levels for upgrades feels too artificial — I rather have a “full” slot for each upgrade that the player unlocks. Similarly, cost will go to crafting gear from scrap rather than using on upgrading. I’ll get to that. It now shows all the individual bonuses the upgrades provide. Now, this isn’t to spec yet as I need recipes instead of permanent unlocks, but I’ll get to that in the future. The gear isn’t wired yet, but the upgrades work fine. 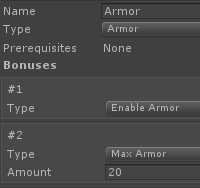 This might be slightly over-complicating the bonus system. But at the same time, it’s modular, reusable, clearly defined, and extendable. It has maintenance and readability costs, but it also let’s me iterate quickly and potentially wire bonuses to other things. For example, a per-playthrough bonus, a per-dungeon bonus, etc. Alright, so that brings the codebase up to speed with the new design direction. Now I need the new features and I will cover these one at a time in future posts.